I made you a salad, but instead of lettuce, spinach, or other greenery, I used toasted crusty bread. You’re welcome. 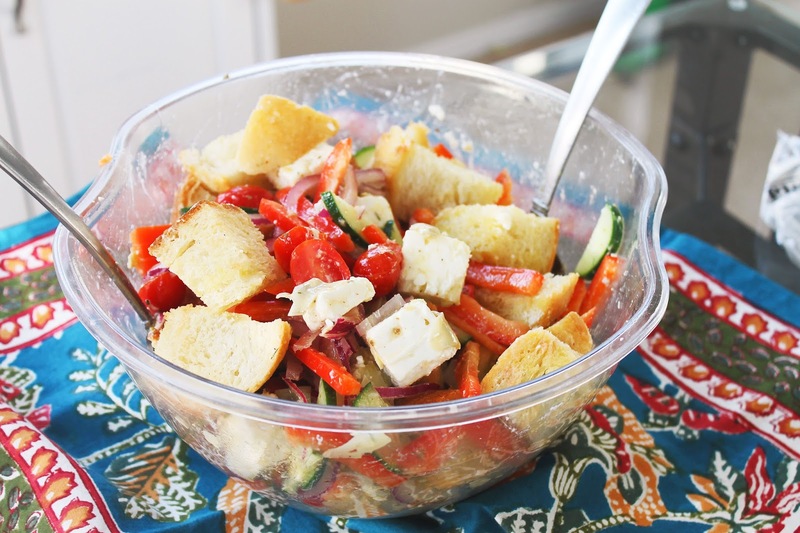 Panzanella is a Florentine salad that traditionally combines stale, soaked bread with tomatoes and basil, olive oil and vinegar. Bread that is considered too stale to enjoy by itself is either soaked in water and squeezed dry or soaked in oil and vinegar until it came back to life. It’s like croutons, but with the old adage waste not, want not, in mind. For me, though, all I hear is “bread salad.” A salad with all my favorite flavors and ingredients all soaked up by crusty bread? That is a winner. 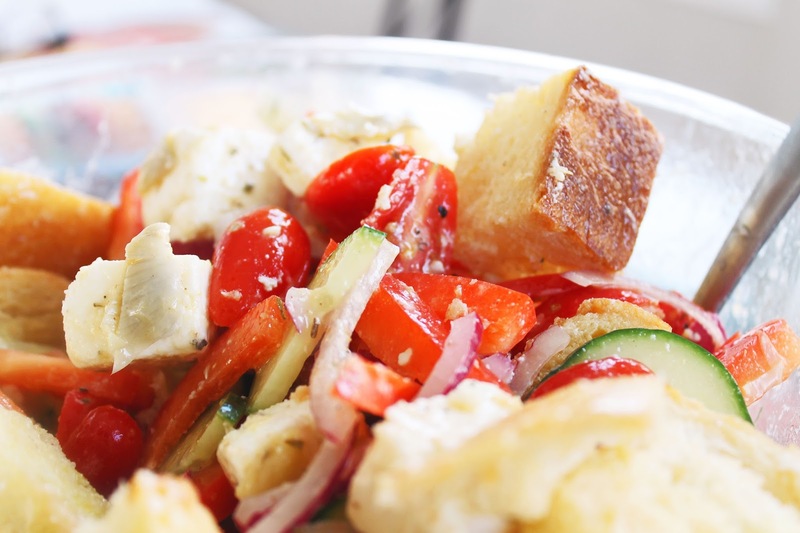 This salad takes all the traditional components of a great Greek salad and throws toasted crusty bread in the mix. The bread soaks up all the flavors from the dressing and the vegetables and because it is toasted prior, it maintains a crunch. No one wants soggy bread. It’s the perfect side dish to any Summer meal, but I enjoyed it with my Baked Greek Chicken Meatballs and plenty of Tzatziki sauce. Oh, did I also mention it’s incredibly easy to throw together, and that most of the components can be made in advance? This is Summer, folks. 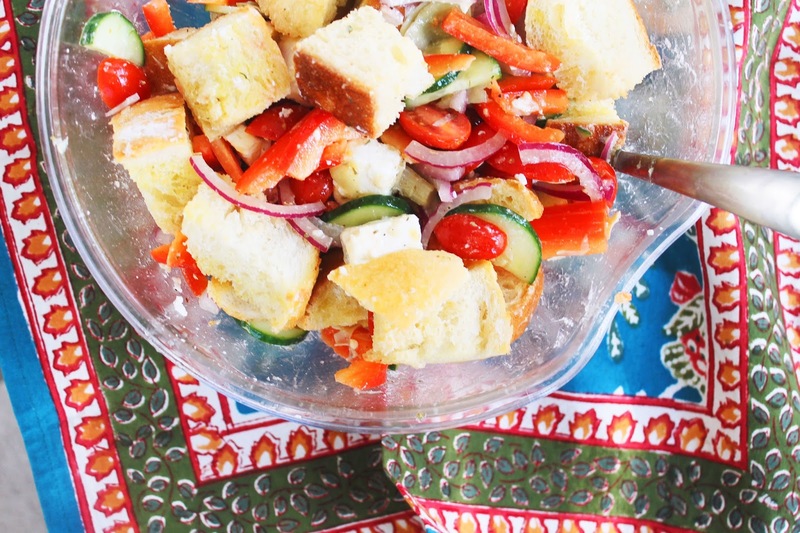 Serve the salad right away so that the bread remains crunchy. 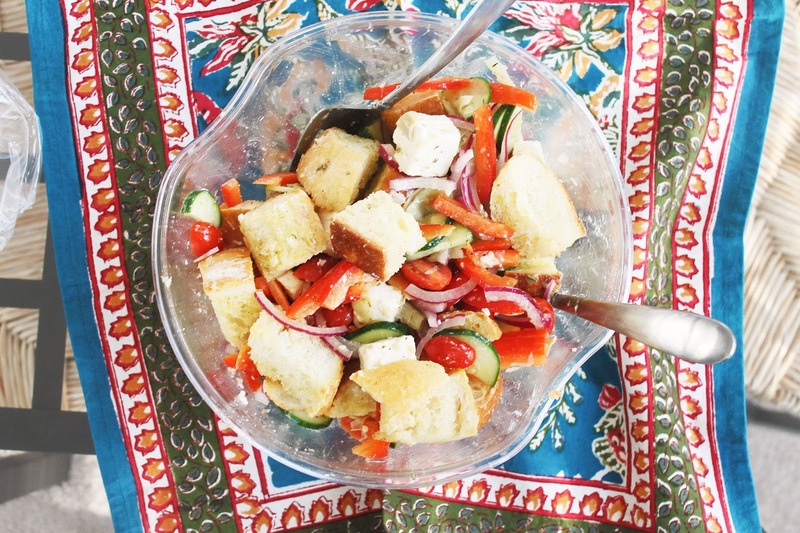 This would be divine as a side dish to any burger night, or make it a Greek feast and follow my lead. This is Summer’s bounty and bread is holding it together. Get on board. While this salad is designed to remain crunchy and toasty, don’t be afraid to eat leftovers the next day. 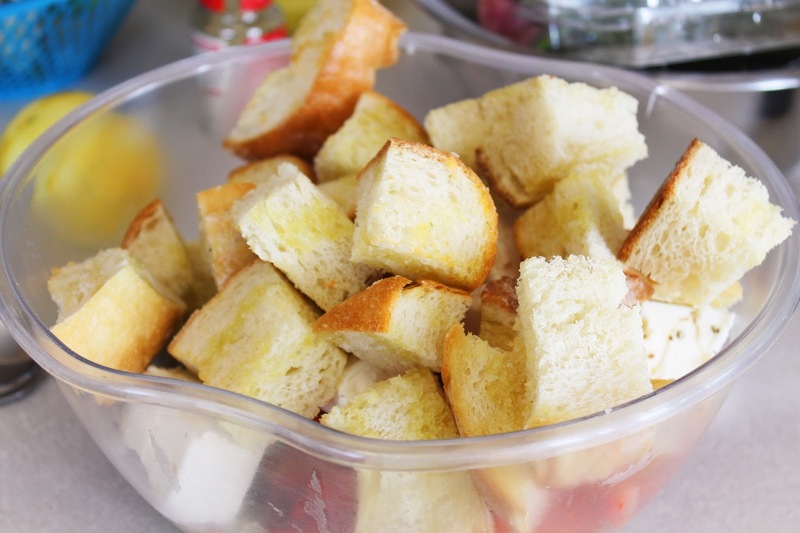 Sure, the more the bread sits, the more it soaks up all the liquid, but if serving it right away gives it more of a crouton texture, serving it the next day gives it a traditional panzanella vibe. The bread is soft but not mushy and it has soaked up all that dressing, tomato, cucumber, briny goodness. I can’t decide which way I enjoyed more! And there are giant chunks of feta cheese. So, if you weren’t sold before, you should be now. Put all the ingredients in a jar with a tightly fitting lid. Place the lid on the jar and mix it well until the dressing is creamy and emulsified. Store in jar for up to a week. 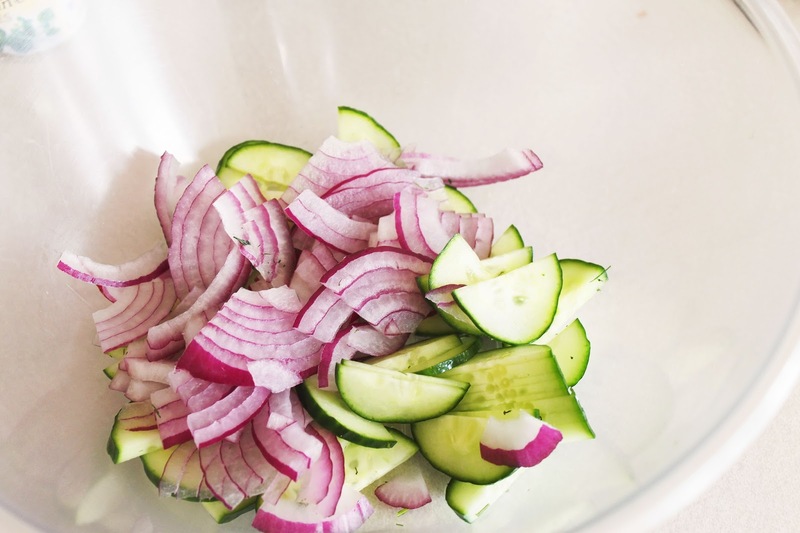 In a large salad bowl, combine the vegetables. Toss together. Add the cubed feta cheese and the vinaigrette. Gently toss to combine. Meanwhile, preheat oven to 400 degrees. Spread cubed bread onto a baking sheet. Drizzle with olive oil and sprinkle with salt. Place in the oven and toast until golden brown, turning as needed. Remove from the oven and let them cool slightly. When cooled, add them to the salad bowl. 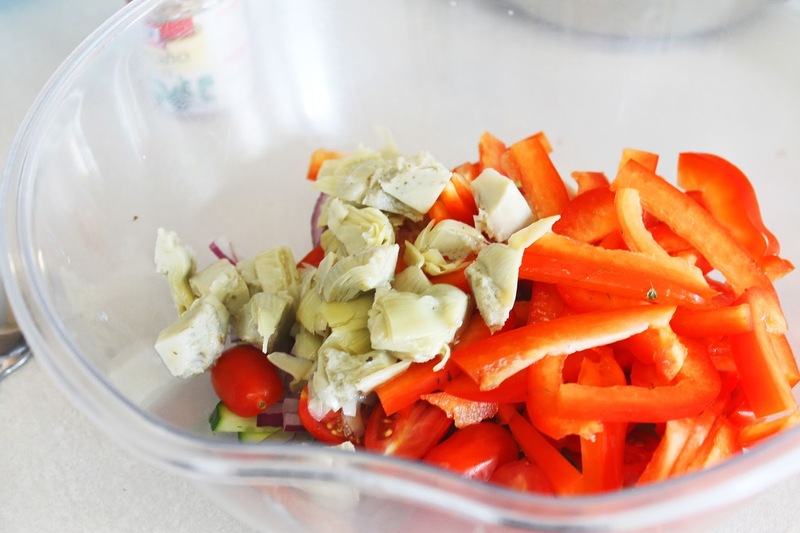 Toss gently to combine so that the vegetables are evenly distributed and the dressing is coating everything. Serve immediately alongside your favorite Greek dish!